Hundreds of art-lovers crowded last night into the Torpedo Factory on the waterfront in Alexandria, Virginia to hear a long-awaited talk by Richard Ormond, a Victorian painting specialist, art curator, former deputy director of the National Portrait Gallery in London, and expert and author of several books on John Singer Sargent, an acclaimed American 19th century artist. For two hours, the attendees sat on metal folding chairs arrayed on the concrete flooring and beneath the dim light, exposed pipes, and fire sprinklers of the Torpedo Factory’s art gallery atrium. 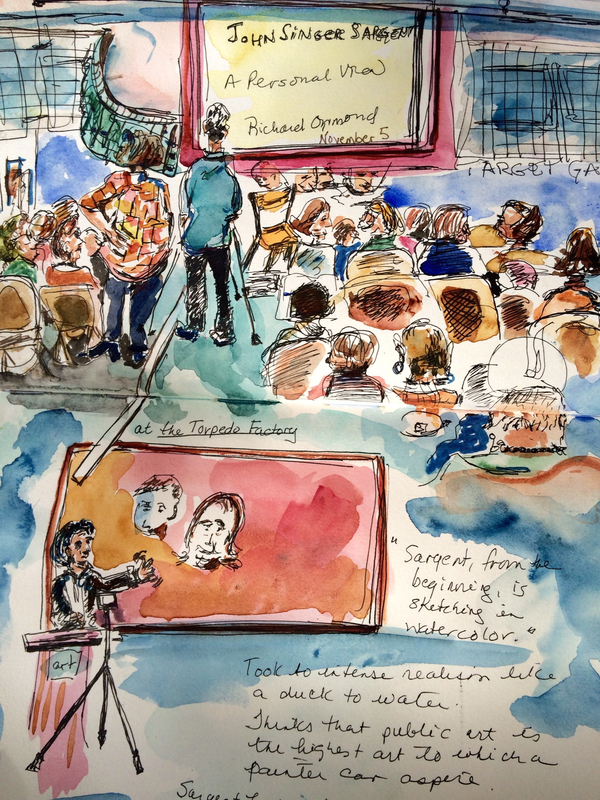 Due to the narrowness of the hall, more than half the audience relied on a second projection screen set up mid-way in the atrium. Others were perched on seats on a narrow overhead bridge connecting the two sides of the gallery. Some were dressed up as if attending an event at the Kennedy Center, apparently happily oblivious to the warehouse-like surroundings. There was a buzz of excitement inside but outside still more hopeful attendees unfortunately were being turned away at the door. (This free event was solidly booked and “sold out” by late summer, if I remember correctly.) This was the event to be at at the bottom of King Street last night! Amid the torpedo relics still on display in this popular art gallery and school (once an actual torpedo factory, as its name suggests), Ormond presented a lecture that reviewed Sargent’s life and works chronologically. A grand-nephew himself of John Singer Sargent–whose sister, Violet, was Ormond’s grandmother–Ormond weaved personal details and black-and-white photos from his childhood into his talk. Images of Ormond and his brothers as young children flashed up on the screen briefly, for instance, sitting on a wall in Switzerland on what he described their first outing away from London so recently under siege in World War II. Sitting in an old torpedo factory which was the site of feverish activity at that exact time and listening to this gentle art expert was a study in contrasts in itself. He noted that Sargent maintained an “active dialogue” (through perceptive observation, not speaking) with his sitters, so that his portraits conveyed the liveliness, the powerful personalities, and even the “tigress”, in one case, that was in his models. 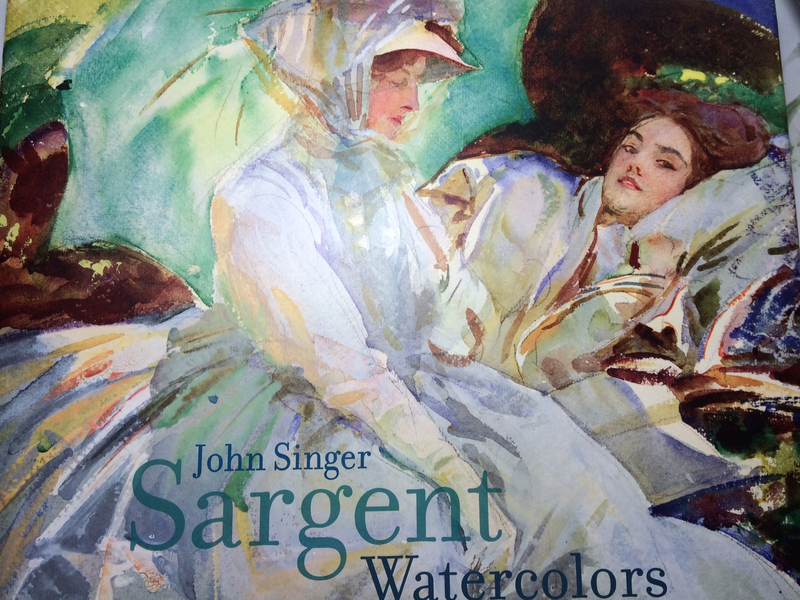 Sargent’s analysis was not one of passive disengagement and objectivity. He was capturing, and captive of, the essence of his models–a very subjective approach to interpreting reality. Ormond also noted that Sargent considered “public art,” such as the murals he trained himself to paint, the highest form of art (as opposed to art held in private collections). This is one reason he resisted selling his watercolors. Ormond also displayed a photo of the artist’s oil painting of “Gassed” from 1919 showing British soldiers blinded from the use by the enemy of mustard gas in World War I. Perhaps the biggest take-away of the event was the appearance and bearing of the speaker himself, someone who has devoted a half a century to the study and promotion primarily of John Singer Sargent, and whose familiarity with exhibits and the world of museums and archives is therefore likely second to none. A second takeaway was the makeup of the audience, generally older afficionados of this art community, many of them past and current students in the Art League School. It was, in this sense, a powerful community event combining both appreciation of a great artist’s powers of observation and appreciation of beauty at a time when our sensibilities and priorities globally sometimes seem dulled to both. Sounds like an interesting evening. We love the Torpedo Factory, but I did not know they have events there. PS: good summary. Did you know that Boston has the home of Sargent’s biggest patron, Isabella Stuart Gardner? The Gardner just completed a wonderful addition that really enhances the original structure. 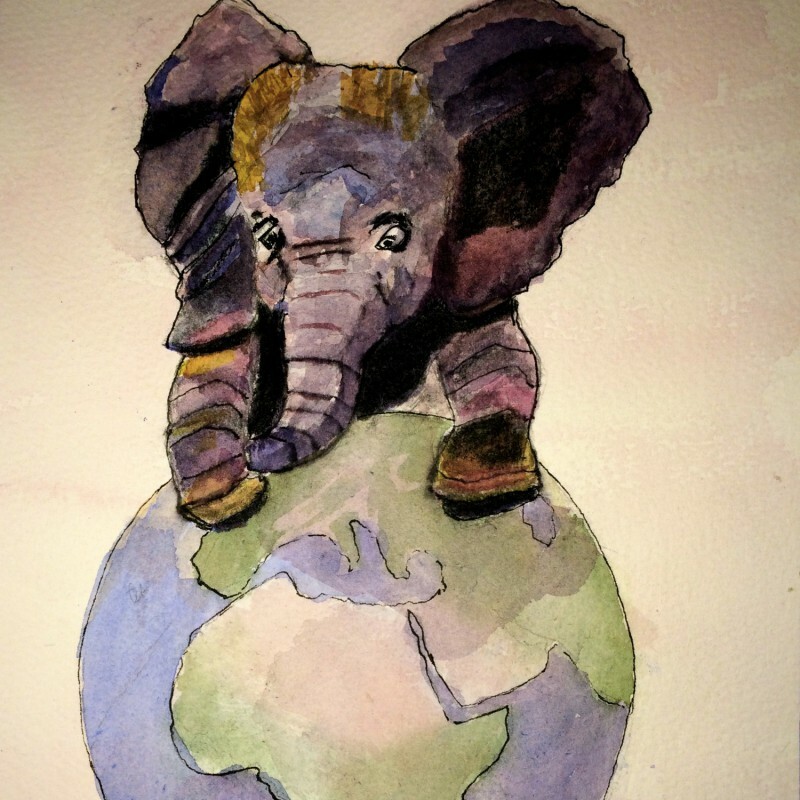 Love this post and your sketches! I actually write the blog for The Art League — I’m the guy in the blue shirt standing behind the tripod — and I was wondering if I could share your sketch and recap on our blog sometime. If so, let me know how to credit it! Thank you, George, for your note. I am honored that you could recognize yourself in the sketch! 🙂 You may, of course, use the sketch and blog post on your blog sometime, and you can credit it to this blog.Thanks again.